There are many factors which have an impact on the material properties of a roof material. Properties which influence the life cycle of the roofing include elevated temperatures, UV and ozone resistance. To determine the service life of an EPDM roofing system it is necessary to make a comparison between the mechanical properties of both new and old EPDM samples. 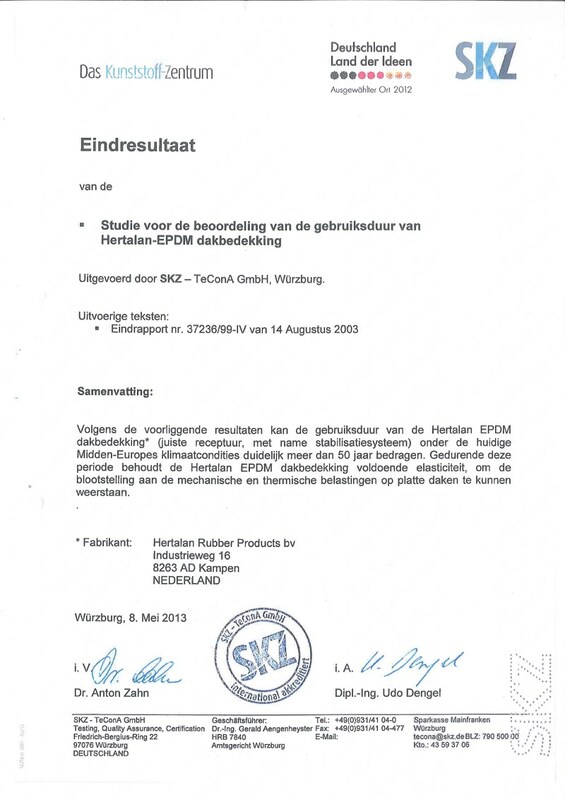 This study was commissioned by the German rubber industry (WDK) and the VESP and conducted in the late 90s by the SKZ. SKZ is one of Europe’s largest accredited and certified institutes for quality assurance, monitoring over 900 products for more than 400 companies. SKZ carries out its own research and development and offers consultancy with turnkey solutions for example on sustainability of polymers. Next to its headquarters in Würzburg SKZ has branches in Halle, Peine and Horb, Germany as well internationally in the UAE and China. The reference lists of the participant participating EPDM producers for the SKZ were IN TOTAL 39 selected roofing projects in Germany, Austria, the Netherlands and Sweden, ranging in age between 1968 and 1996. The mechanical properties of the samples were tested, such as hardness, tensile strength and elongation at break. Then the samples were subjected to accelerated ageing in the laboratory of SKZ. As a comparison the mechanical properties were determined from a new EPDM sheet. It should be noted that there can be a maximum of 30 years difference between the production and the samples cut out of the roof. And that therefore slight adjustments in the formulation are to be expected. All investigated roofs turned out to fulfil their function as an EPDM roofing, there was visually no serious ageing visible in the samples. All the membranes have a full extent of the alleged function as water proofing. The elongation at break property was chosen in the study as the most significant feature to be be measured. The degree of ageing where (very conservative and arbitration), as minimum limit the elongation at break is set at 150%. In this study an average was measured well above 250%, in this there are also samples of about 30 years old. The results of the study indicate a theoretical service life of the tested EPDM elastomer roofing of more than 70 years. Taking into account all production and material differences including the different application methods a practical service life of 50 years was advised by SKZ.